Every couple of months we like to share information about the Angles Insurance agencies in Manassas and Chantilly. Our insurance newsletter presents ways to protect homeowners and drivers, and introduces topics on car insurance, life insurance, and home insurance. 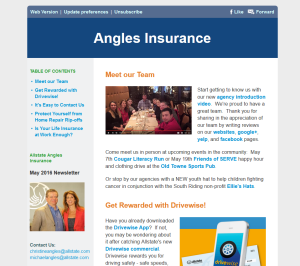 In the May 2016 edition of our newsletter meet our team, learn more about Allstate’s new safe driving reward program Drivewise, protect yourself from home repair rip-offs, and evaluate your life insurance at work. For instance, get Rewarded with Drivewise! Have you already downloaded the Drivewise App? If not, you may be wondering about it after catching Allstate’s new Drivewise commercial. Drivewise rewards you for driving safely – safe speeds, safe stops, and safe driving times. Allstate auto insurance customers receive a reward of 10% of their premium just for trying it out and up to 20% of premium every six months depending on driving habits. And learn to protect yourself from home inspection rip-offs. Be prepared when you get unsolicited offers for a home inspection to uncover damage for a home insurance claim. The key to scammer success is the ability to apply subtle pressure. When you initiate getting bids for repair work, be thorough and take the time to check on details. Don’t let an unsolicited stranger on your roof or into your home. Learn More. There are several potential problems with obtaining life insurance through work. Learn more at Investopedia. Your employer may not offer enough life insurance. You may lose your coverage if your job situation changes. Coverage gets tricky if your health declines. Your plan likely doesn’t provide enough coverage for your spouse. Employer-provided life insurance may not be your cheapest option.